While working at 80|20 Software Consulting, now Array Digital, I volunteered to be a part of the RevolutionConf. 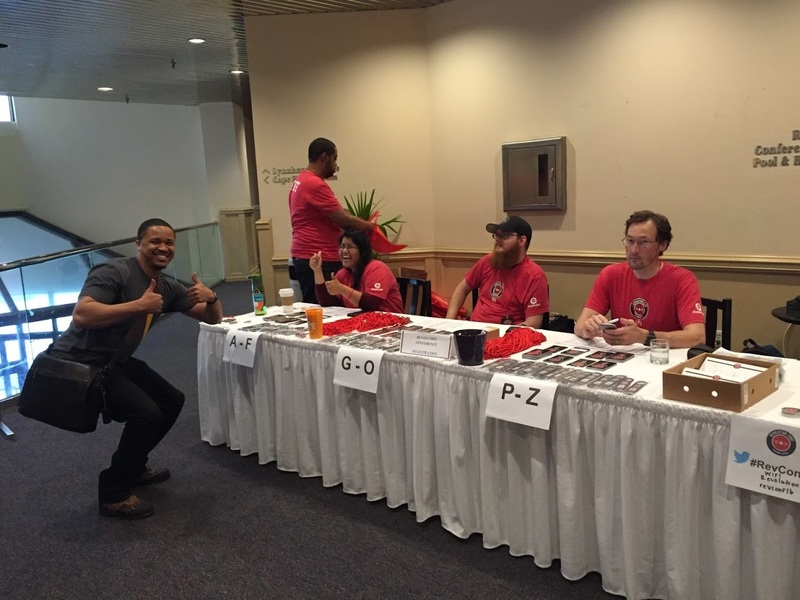 I helped develop the sponsor prospectus, flyers, and helped out with registration in-person at the conference as well as confernece chaperoning. 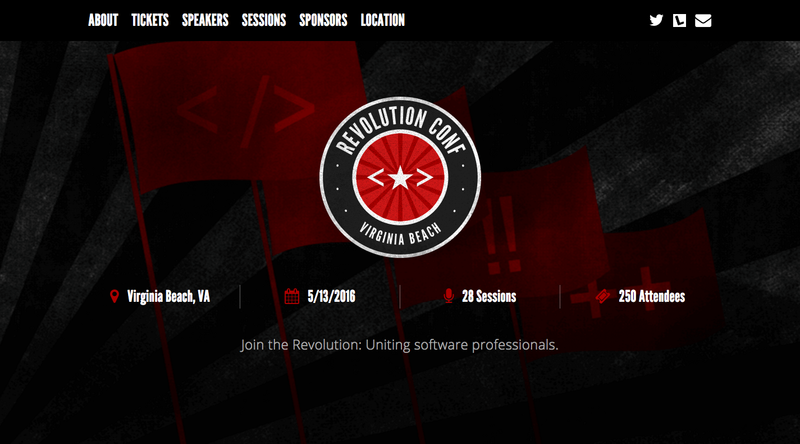 RevolutionConf is a two-day, platform and language agnostic, software development conference in VA Beach. It hosts talks from regional, national, and international thought leaders. RevolutionConf is organized and supported by the board members of RevolutionVA, a 501c3 nonprofit based in Norfolk, VA. 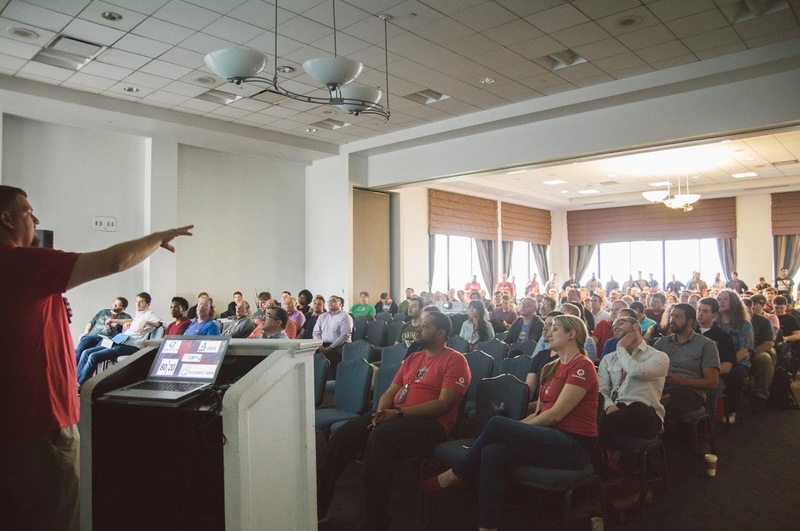 The goal of RevolutionVA is to unite software developers in the mid-Atlantic region through conferences, and career and learning opportunities. May 2016 - This blog post on the conference got featured in The Daily Press. Back in November of last year, as we were driving to an Hour of Code professional development workshop all the way down in North Carolina, I was telling a buddy of mine - Chris - that even though I love Norfolk (where I was born and raised my whole life), I’m probably going to leave soon in order to explore places where supposedly the most innovative technologies are currently brewing (cough cough like Silicon Valley specifically). What's your favorite change in the #SiliconValleyHBO opening credits? He told me that while he understood why I would want to do that - after all, the Bay Area is an established tech “haven” - he also explained that Norfolk had something special and it was the fact that Norfolk is in the process of becoming an ideal tech haven RIGHT NOW. That means that there is no set culture for the 757 Dev Area because it hasn’t been entirely developed yet. And then Chris told me I could help develop it if I stuck around whereas, with places like Silicon Valley, the culture was already pretty set in stone by those who helped plant its core tech roots. My mind was blown - Chris was right! Norfolk’s tech scene is growing EVERY DAY. 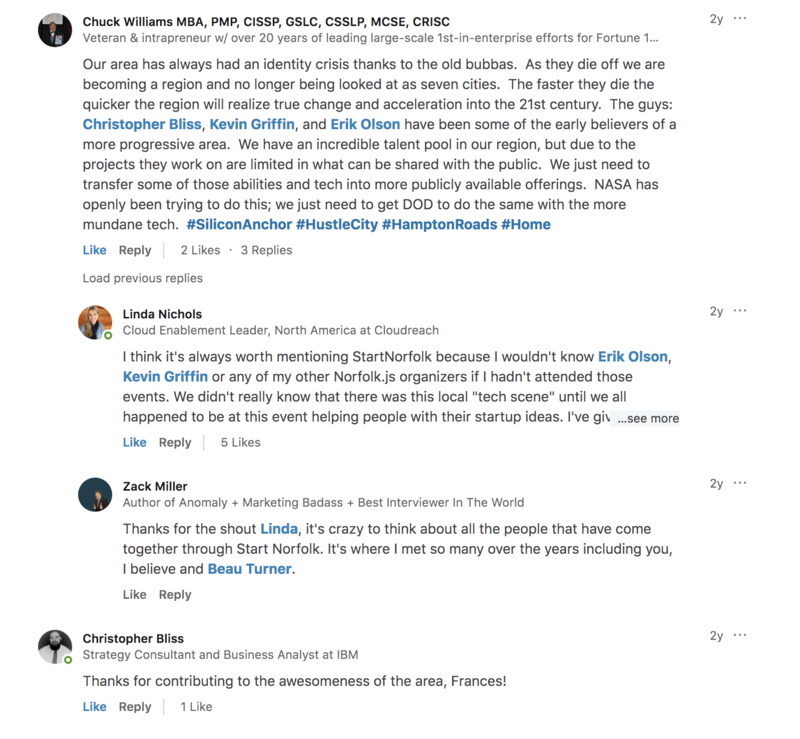 Between the newly established Free Code Camp Facebook study group for the Norfolk area, the consistent slew of Meetups I see pop up every week, PixelFest happening back in April, and now the upcoming RevolutionConf, it’s not very hard to see how that growth is occurring. Funny thing is - what most people don’t realize is that the Norfolk/VA Beach area already has its own tech area name or what have you - it’s Silicon Anchor. You may be more familiar with the terms “Silicon Alley” which is supposed to represent the vibrant tech scene in NYC or of course “Silicon Valley”, the original location of San Jose, CA (but there are plenty of others like Silicon Forest and Desert and it goes on and on). Now that name hasn’t really caught on 100% given that 757Dev has taken more of a stronghold when it comes to catchphrases, but I will say that a quick Google search of List of places with ‘Silicon’ names” will verify this little factoid - I’m not making it up! A go-to guide on everything you will need to know in the Norfolk/ Virginia Beach startup community. POINT BEING… Norfolk, overall, is a pretty awesome city. And we have pretty AWESOME developers here. I think what Erik, the CEO of 80|20 and one of the chief organizers of the conference, has stated before definitely resonates a lot with me. Regardless, I’m so excited to be able to act as a volunteer for this upcoming RevolutionConf. Having known Erik from my gig at 80|20 and Linda from the Norfolk.js Meetup group, I can say without a doubt that the organizers have whipped up something quite fantastic and probably an event that is long-term (as in it’ll keep growing year after year as intended). Kevin seems cool too! 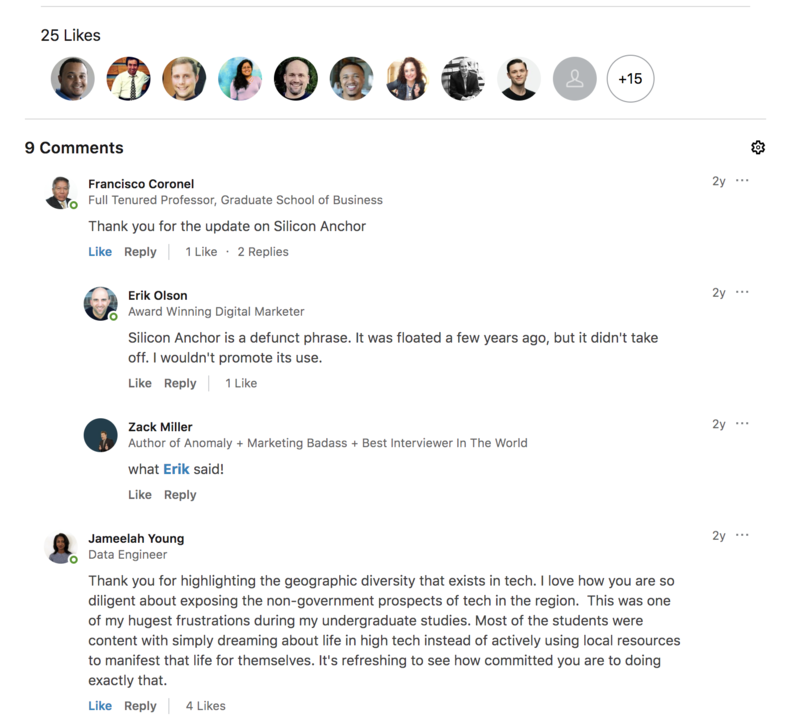 In the end, as a Norfolk native, I want people from all over the nation to eventually see this region - the 757 - the Silicon Anchor - Norfolk - VA Beach - Hampton Roads as the kind of place that can successfully launch tech savvy businesses - especially the kind of edgy tech startups that makes waves on sites like Reddit, Hacker News, and Product Hunt. And I believe RevolutionConf is taking us one step closer to that. 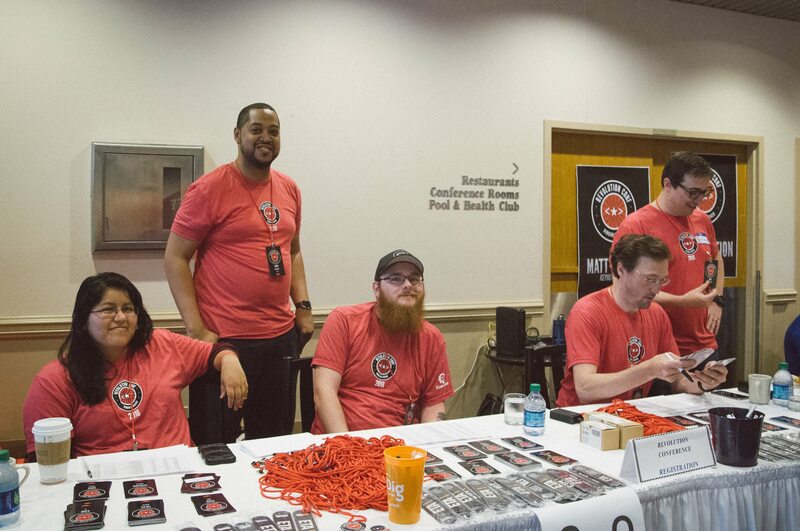 RevolutionConf is a two-day, platform and language agnostic, software development conference being held on June 1-2, 2017 in Virginia Beach, VA. We are a 501c3 nonprofit that formed specifically for running this and other great events for software developers in the area. The software industry, including speakers from Microsoft, Detroit Labs and Yahoo, is converging at the Virginia Beach Oceanfront today.